That vibrant orange color tells us something about pumpkin’s health properties. Yes, it’s an excellent source of beta carotene, the powerful antioxidant. Our bodies translate beta carotene into Vitamin A, which is thought to protect us from certain cancers and other diseases, too. Vitamin A is also key for keeping your eyesight keen. Pumpkins are also a good source of fiber, potassium, and vitamin C. The seeds, meanwhile, are packed with fiber and protein; they are also an excellent source of zinc, magnesium, manganese, iron, and monounsaturated fat. 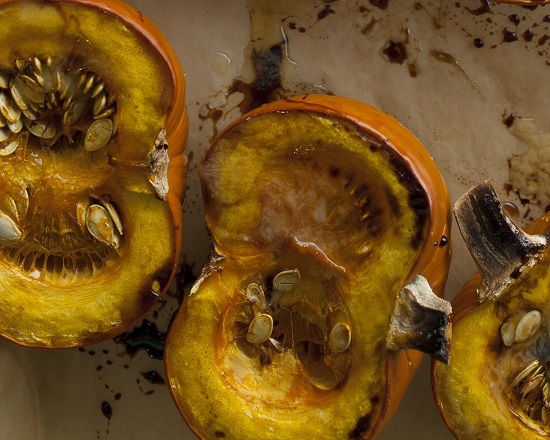 In the kitchen, treat pumpkin as you would any winter squash. Try it in healthy soups, stews, chili — even pancakes.